Colombo is the largest city on the island of Sri Lanka. It is noisy, frenetic, but is relatively easy city to find your way around. To the north is the Fort district, the country's business centre, which has department stores, book shops, airline offices and is the site of the Central Bank, The World Trade Centre twin towers. There are also ample sights such as the clock tower, a former lighthouse, the president's residence (known by incorrigible traditionalists as Queen's House), and a cluster of colonial buildings which lend the district an aura of bygone Empire. Immediately south of here is Galle Face Green, a seafront expanse of occasional green graced by cricket games, kite flyers and trysting lovers. Cinammon Gardens, further south, is Colombo's most fashionable neighbourhood, with elegant mansions, tree-lined streets and the city's largest park. East of the fort is the pungent Pettah bazaar district. Walk through and marvel at the riot of goods - fruit, vegetables, meat, gems, gold, silver, brass and tin junk. Culture buffs shouldn't miss the National Museum, which has a good collection of historical works, the Art Gallery, which focuses on portraiture and temporary exhibits by local artists, and the city's many mosques and Buddhist and Hindu temples. After familiarising yourself with Sri Lankan culture, check out the island's fauna at the Dehiwala Zoo. The highlight here is an afternoon elephant show. The closest real beach is at Mt Lavinia, a faded resort 10km south of the city. 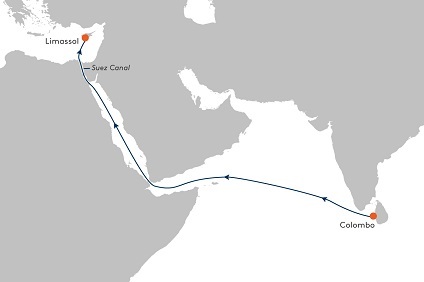 Transport Links – There is air service to and from Sri Lanka, provided by Sri Lankan Airlines. Flights are available from origins throughout Europe, United States, Southeast Asia, China, Japan, the Middle East, India, and Pakistan. The most common mode of transport in Sri Lanka is via a three-wheeled automobile appropriately referred to as a three-wheeler. Buses run frequently, trains go to some areas and rental cars are available . 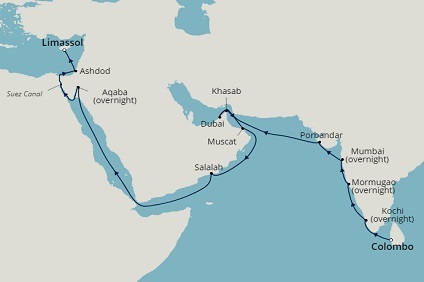 14 Night Cruise sailing from Colombo to Dubai aboard Boudicca. 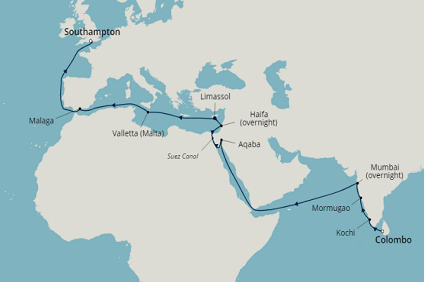 28 Night Cruise sailing from Colombo to Limassol aboard Boudicca. 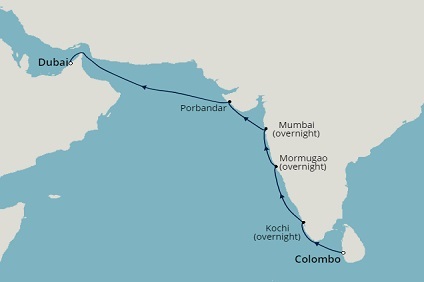 29 Night Cruise sailing from Colombo to Southampton onboard Black Watch.